I WAS weaned on Sri Lankan food. My mother, since the 1970s, was possibly one of the few non-Singhalese women in Australia who roasted and ground her own spices and made her own curry blends. What made this unique was that in 1970s Australia (and especially in suburban Adelaide), white women just didn’t cook like that – they were experts in traditional ‘Aussie” tucker like roast lamb and vegetables – not ‘curry and rice’. To sample exotic cuisine in 1970s Australia, one had to drive to a suburban pizza joint or Chinese restaurant to get some sweet and sour pork. My upbringing involving the delights of fiery Sri Lankan cuisine was furthered by almost weekly visits to Mr and Mrs Nelson Joseph’s Ceylon Hut in Bank Street (now gone) near South Australia’s Parliament House. This high temple to curry, later taken over by their daughter Naylene and her husband John Ruppert, was the meeting place of 1970s Labor party Parliamentarians and powerbrokers. My father, an advisor to the progressive Labor Premier Don Dunstan (you remember him, he is the guy who wore a safari suit and pink shorts in South Australia’s Parliament and was also responsible for decrimalising marijuana), didn’t muck around here in his advice or when it came to ordering, and gradually my brother Paul (now a chef) and I went from the bland chicken Maryland to a full Burgher reistaffel with all the trimmings (minus the alcoholic cider always at the table). My early years of growing up and eating in the Baker household made for some interesting experiences when I invited schoolmates over for dinner. My love for Sri-Lankan cuisine was further enhanced by two visits to the island nation – once for work and again when I dragged mates over for the full-blown tour of the country. What I found was mum was pretty spot on with her curries after all. On a recent trip to Melbourne I was almost uncontrollable with excitement when I found the Sri Lankan Ceylon Curry House at 191 Clarendon Street, South Melbourne. This non-descript and basic eatery has room for about 20 but from seeing the queues at lunchtime it seems that its main trade is with takeaways. Dining in is not discouraged, and eating on either the long wooden communal table or at one of the small inside or street tables, is pleasant. You order from a bain-marie buffet – there also is a fridge at a side of the counter which is stocked with soft drinks and also with, most importantly, Sri Lanka’s two famous brews – Elephant Ginger Beer and Sinha Beer (both the Lion Larger and the stout). I decided to have a plate of two meat curries and two vegetable curries with rice ($11.90). There was a choice of freshly made curries so I opted for the cooked potatoes, fried green beans, a rich meatball curry (which I was assured was traditional right down to the minced chilies in the meatballs), and a chicken curry. I couldn’t resist having a Lion Larger ($3.50 on Fridays, $5 on other days) for old time’s sake. The serving was generous. The diced potatoes had been cooked in a blend of coconut milk with flaked dried chili, curry leaves and mustard seeds with the addition of saffron to give its mild yellow colour. The devilled beans had been lightly stir-fried, making them slightly tender yet still crisp and fresh. Both these vegetable dishes were savory and full of spice and a marvelous accompaniment to the meat curries. The meatball curry brought back memories of my youth. They were tender beef meatballs seasoned with roasted curry powder with hints of garlic, chilli and ginger and cooked in a rich, sweet and flavoursome coconut gravy. The meatballs (known as frikadel) packed the required zing of chili that I remembered (and got me addicted to capsaicin). The tender chicken curry was full of that roasted curry flavor which makes Sri Lankan curries not only robust but unique. The dish came with rice on the plate and a popodum. The restaurant also offers an array of takeaway curry packs from $11.90 to $13.9 as well as traditional Sri Lankan condiments such as sambal, chutney and pickles, as well as a large selection of tea. There isn’t an al-la-carte menu as such – you choose what is cooked on the day (or on the hour when choices in the buffet need replenishing). It’s pot luck what you might get on any given day but that is one of the highlights of this simple yet value for money eatery – it’s the endless variety. My bean dish came straight out of the wok and onto my plate and once that was gone it was gone (but its spot at the buffet was replenished with another vegetable dish). The Sri Lankan Ceylon Curry House also has a Hopper Night on the last Saturday of each month with a choice of white and red String hoppers or Hoppers and egg hoppers with a choice of different curries for $17.50. The verdict: Traditional Sri Lankan home-style food cooked without fear or compromise. Great value. With a high turnover of dishes its offers regulars diners a huge choice and scope to explore marvelous Sri Lankan-inspired dishes. 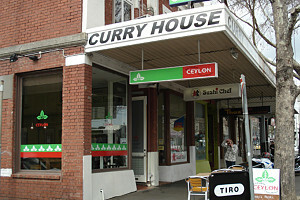 What: Sri Lankan Ceylon Curry House, 191 Clarendon Street, South Melbourne. Open: Monday to Friday 11.20am to 8pm and on Saturday from 5pm to 8pm. Phone (03) 9690-9919. Ate there: 19 March 2010. This entry was posted in Melbourne, Sri Lankan, Victoria and tagged Ceylon, Curry, Food, Melbourne, Sri Lankan, Sri Lankan Ceylon Curry House. Bookmark the permalink. The Sri Lankan dining experience seems to be, by tradition, a very communal or family-centric event. I had an interesting Sri Lankan buffet experience at Aahara (Hutt St, Adelaide) a few years ago. Everything from the pots in the bain marie to the decor and decorations on the wall were very homely (i.e. old, mismatched and a little kitsch), and the owner’s kids played in and out of the dining room. Much like the food, it was all part of sharing in an experience of home dining. The chef wandered around generously dosing out the hoppers – personally, I don’t see the appeal for the hopper, but I love the Sri Lankan buffet. Will definitely visit the Ceylon Curry House when next in Melbourne. Ron, possibly. Wonderful place, wonderful childhood memories – will ask and get back to you.